Samsung and Apple are about to go to court - again - but one company is already coming out ahead in pre-trial proceedings. Judge Lucy Koh, who's been dealing with the companies' bickering for years, has granted Apple two victories against Samsung as their March trial approaches. The first has to do with an autocorrect patent held by Apple. 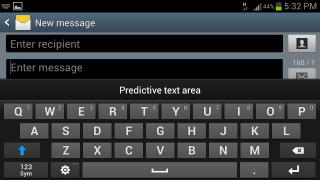 Samsung's Android smartphones, including the Galaxy Nexus and the Galaxy Note, use a keyboard system that predicts what words users are typing and displays its own guesses in real time. It's convenient for users, but Koh found the system infringes on Apple's patent for the tech. Koh's ruling is such that the only way Samsung can win is to prove the patent is invalid. And it's not just Samsung on the hook; if the company can't prove the patent doesn't hold water, Google may find Android as a whole open to lawsuit from across the IL. The other blow relates to a Samsung patent for syncing media between devices, which Koh ruled to be invalid. She agreed with Apple's arguments that the Samsung-owned patent added too little to systems that existed before it to be considered valid. That means Samsung will have only four claims left to fight over when the March arrives. Alternatively, Apple and Samsung might find a solution when they duke it out privately in February, though considering how pointless their settlement talks have been in the past it's more likely this case will go to trial. As if you didn't already have enough of these two, it's also come to light that Apple has been insisting that any settlement it reaches with Samsung has to include an anti-cloning provision. This means that Samsung would be prevented from "copying" Apple products in the future. Considering this years-long battle is at least partially based on Samsung's assertion that it doesn't copy Apple products, we're guessing that hasn't gone over well with the Korean company. Check out TechRadar's review of the latest and greatest Apple phone, the iPhone 5S.